Image credits: Dave/Flickr Creative Commons/CC BY 2.0; Acropora at English Wikipedia; Martin Haas/Shutterstock. There has been much talk globally about limiting global warming to 1.5°C instead of 2°C. This distinction might seem minor, so what difference would half a degree really make? 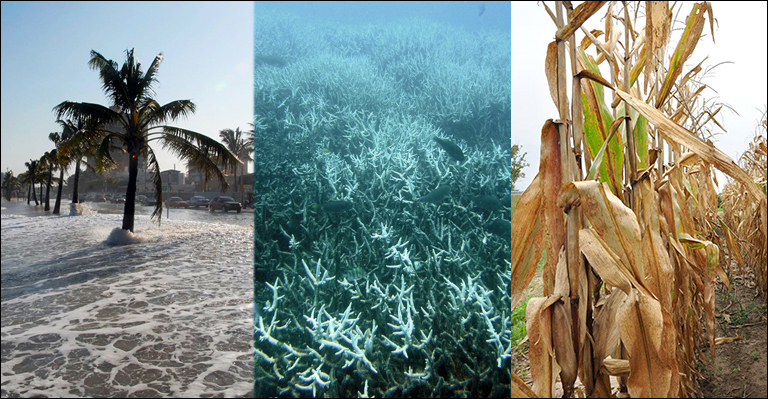 “At 1.5 C, the study found that tropical coral reefs stand a chance of adapting and reversing a portion of their die-off in the last half of the century. But at 2 C, the chance of recovery vanishes. Tropical corals are virtually wiped out by the year 2100. “With a 1.5 C rise in temperature, the Mediterranean area is forecast to have about 9 percent less fresh water available. At 2 C, that water deficit nearly doubles. So does the decrease in wheat and maize harvest in the tropics. And this analysis doesn’t even mention the further effects of such changes, such as increased migration of people and animals due to homelands and habitats disappearing. Read more, including NASA’s analysis of the findings, here.